Remove the stress and hassle of travelling with your pet on commercial airlines. Charter a private jet so that your pet can travel in the cabin with you, in a safe, comfortable and secure environment. Travel to your favourite holiday destination with your pet on a pet friendly aircraft. The best and most ideal solution for your pet is to travel on-board with you. 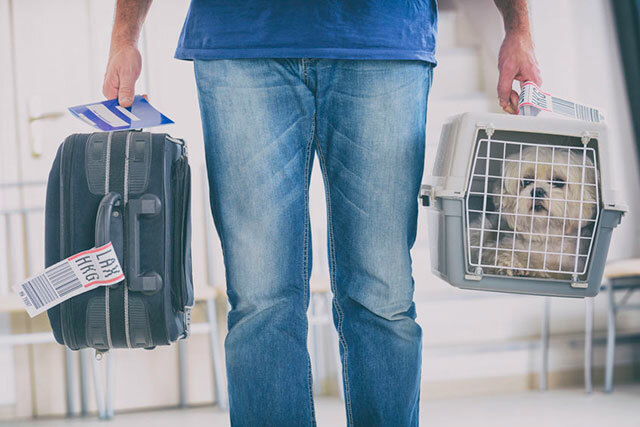 As long as your pet passport is all cleared, you and your pet can board your aircraft. On your return your pet will be checked and have its microchip scanned. This is swift procedure and can be done either on or on the ramp. The great thing about flying on a private jet with your pet is that they get to travel in the cabin with you. They can move around the cabin once the aircraft has taken off and the seat belt signs have been turned off. Our aim is to make you and your pet as comfortable as possible. For take off and landing your pet must be in a seat with a belt on. Smaller dogs and cats must be in a regulation sized pet carrier. This is for your safety and your pets safety. DEFRA must pre approve you as an operator to that particular airport before travel. Getting approval from DEFRA can take up to two weeks. You must ensure that full health documentation is available for the animal. Has been vaccinated against rabies – it will also need a blood test if you’re travelling from an ‘unlisted country’. Dogs must also usually have a tapeworm treatment. Your pet may be put into quarantine for up to 4 months if you don’t follow these rules – or refused entry if you travelled by sea. You’re responsible for any fees or charges. Your pet must arrive in the UK no more than 5 days before or after you, or you’ll have to follow different rules. You must use an approved transport company and route unless you’re travelling between the UK and Ireland. You must wait 21 days after the vaccination (or the last of the primary course of vaccinations) before bringing your pet to the UK from an EU country, or another country. The UK accepts pet passports from a listed country. A vet must treat your dog for tapeworm and record it in the pet passport or third-country official veterinary certificate every time you want to bring it to the UK. The treatment must have been given no less than 24 hours and no more than 120 hours (5 days) before you enter the UK. Your dog can be refused entry or put into quarantine if you don’t follow this rule. All the charter operators that we select for your private jet pet flight, are DEFRA approved to transport cats and dogs into these UK airports. . The following airports – Manchester Airport, Edinburgh Airport, London Stansted Airport, Biggin Hill Airport, London Oxford Airport, Blackpool Airport, Doncaster Robin Hood Airport, Cambridge Airport, Leeds/Bradford Airport, Bristol Airport, Glasgow Airport and Farnborough Airport are all approved to cater for pet travel in the UK.